Canada’s Important Bird and Biodiversity Areas Program is a science-based initiative to identify, conserve, and monitor a network of sites that provide essential habitat for Canada’s bird populations. 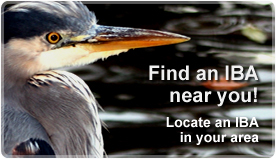 An IBA search engine you can use to access maps, and identify bird populations, habitat types, and land use activities at Important Bird Areas across Canada. 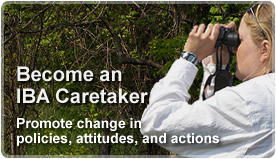 Tools for Canada’s network of IBA Caretakers to watch over and protect Canada’s Important Bird Areas, and opportunities for you to join our efforts. News and information about the ongoing work of Canada’s Important Bird Areas Program. NEW! View this website on your mobile device!